Added a 1971 Grande to the stables. It has a 351C auto with 56,000 miles. I thought it was the 2nd time around, have receipts including the original bill of sale. I was able to track the mileage through servicing up to Oct of 2014. It is something to play with as I have both Shelbys the way I want them. Congrats, those are cool cars, I saw an old picture of Sarah Palin's one time, it was Grabber Blue. I would like to see that. Mine is red. Is that Sarah Palin in the picture? It is, back in the '80s. Awesome. My neighbor had one the same color, but a 302 car. Love the Spyder wheels on Palins car. Need to post up some pic's. Probably my favorite Ford engine ever or at least a tie with the 427 SO. Beautiful car ! Nice socks ! C'mon now Chris....you know you wore those back in the day too!!! Thanks on the car.... 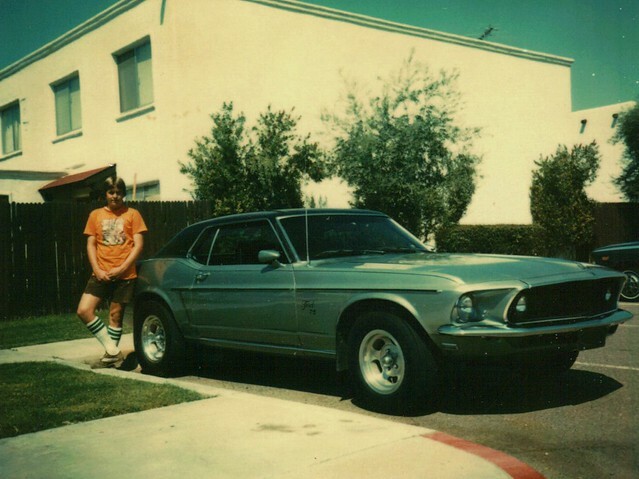 I remember thinking I was a lucky guy to own that beast at that age. I had a job just to support that car at a grocery store as a carry out (bagger). In fact met my wife at that same grocery store doing the same job all those years ago! What do you mean wore them, I still wear them. Mostly while wearing shorts. Mowing the lawn, at the lake, etc. I'm finding it harder and harder to find them with stripes anymore. Hey, I had socks like that. I was driving a 1950 Ford flathead. Are they out of style now? No ! They"ll never go out of style as far as I'm concerned ! As long as you don't wear them with sandals apparently. At least that's what wifee tells me? The car is nice to , a 351 Cleveland I bet you she would be pretty quick.. It was fast for its time Jim. As a young man, I think that car netted me more tickets than any other. Ya I could see that. sly, we never got pics of your Grande'. Yeah, what's up with that. Gotta have the stripes. But I can't wear shorts mowing, just don't like being hit by flying objects on bare legs. Cleveland motors are an EZ spot for the trained eye....the valve covers are way wider. Pretty simple. FROM WHAT I KNOW, THE 351 CLEAVLAND HAS THE WATER THERMOSTAT HOUSING, THAT CONNECTS TO THE RADIATOR HOSE ON TOP, IS BOLTED ON TOP OF THE BLOCK. USUALLY, ALL OTHER ENGINE THERMOSTAT HOUSINGS ARE BOLTED TO THE FRON OF THE MANIFOLD.